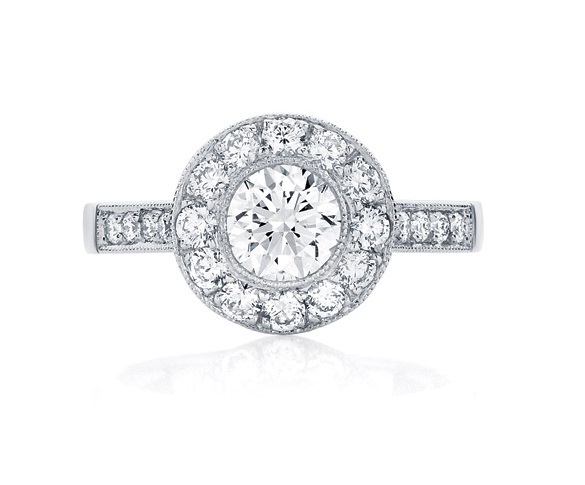 Your engagement ring design options are not limited to solitaires, three stone rings, or rings with side stones. There are endless possibilities of interesting, unique and beautiful engagement ring designs, including cluster rings, gypsy or flush set rings, and pave set rings. 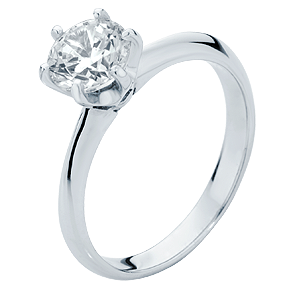 Claw settings, or prong settings as they are also known, are a very popular style of setting for engagement rings. The size, shape and number of claws can vary, each providing a different look. 6 claw settings offer a traditional yet modern look whilst holding the diamond securely, and are the most popular choice for a round brilliant cut diamond. 4 claw settings have a contemporary feel, and are often used for princess cut diamonds, but can also be used for other diamond cuts. 8 claw settings offer great protection and are sometimes used for very large stones, but the diamond can appear a little crowded. Some diamond shapes and ring designs can call for 3 or even 2 claws. The tips of the claws can also be shaped, but rounded claws are the most popular as they are the least likely to catch. A micro claw setting is where a line of round diamonds are joined together by shared claws. This setting method creates a beautiful, streamlined effect that creates the appearance of ‘less metal and more diamond’. 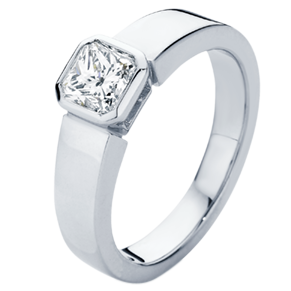 This setting style is often used for fine jewellery designs which need to appear delicate rather than metal heavy. The bezel, or rub-over style, is where the metal completely encircles the outer edge of the stone. The metal is quite literally pushed over the edge of the stone, thereby creating a very secure type of setting for a diamond. The width of the bezel can be varied for different designs and looks. Semi-bezels are where sections of the bezel have been removed to expose some edges of the stone. A well cut diamond doesn’t need light to enter from the sides of the stone, so a bezel setting does not reduce the brilliance or sparkle of a diamond. Some coloured gemstones can be better protected using a bezel, hence prolonging their longevity when worn. The bezel setting offers an excellent method to protect both the girdle (edge) and the pavilion (bottom) of a gemstone from chips and scratches. Popular for diamond wedding rings, eternity rings and ring shoulders, the channel setting is a very neat and continuous method of setting diamonds within a channel, creating a uniform flow of diamonds. It is crucial that the diamonds are calibrated (all the exact same size) in order to be precision set with each diamond touching the edge of the next diamond. 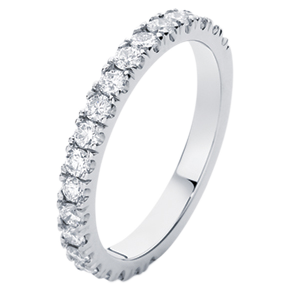 This is a particularly popular setting due to the diamonds uninterrupted flow along the ring with no metal in between. 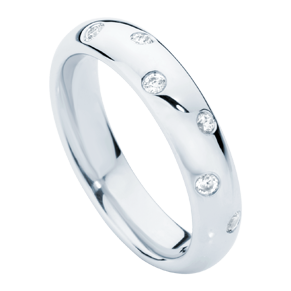 The diamonds sit within small recesses cut into each side of the ring within the channel and are securely held in place. 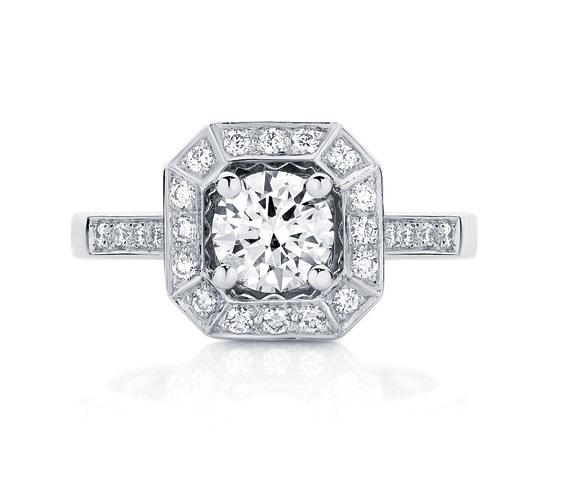 Princess cut diamonds are particularly effective with this design along with baguettes since they follow the lines of the channel with no gaps in between. Bead setting is used for small diamonds, holding them into the surface of the metal using small beads of metal raised from the ring itself, acting like tiny claws. 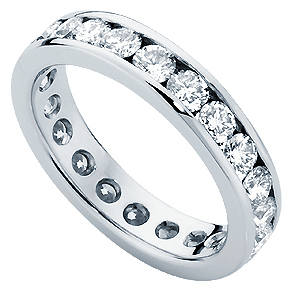 These styles are quite traditional ways of setting a number of small stones in a ring, and when the edges have a millgrain finish this type of setting can achieve an antique look. Bead settings are often used on the shoulders of engagement rings, or to set a row of stones into a wedding ring. Pave setting is used for numerous small diamonds, which are held into the surface of the metal using small beads of metal raised from the ring itself, acting like tiny claws. When there is more than one row of diamonds being set, it is referred to as a pave’ setting, which literally means paved with diamonds. The gypsy setting, or hammer setting as it is also known, involves setting the diamond within the metal itself, flush with the surface. The metal is first cut out to accommodate the stone which is then set into this recess before the ring is polished. The effect is perfect for scattered diamonds in a wedding band or accent stones on the shoulders of an engagement ring. This technique can also be used for fancy diamond shapes. The stones are well protected as they do not protrude above the surface of the ring and due to the metal surrounding them. 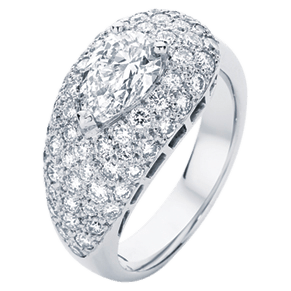 All the engagement ring designs shown on our website can be made with your choice of diamond or coloured gemstone, picked from a selection of loose stones, and in any metal, including White Gold, Yellow Gold and Platinum. Whether you want to choose from one of our classic styles, or create something completely unique, Larsen Jewellery can make a beautiful diamond engagement ring to suit any style and budget. You can use our many display rings to help you choose a style, or alternatively, you can bring in your own ideas or pictures and our jewellers can help you design something special and truly unique. We welcome you to come in for an obligation-free design appointment with one of our jewellers who can advise you on choosing an engagement ring design to suit your individual style.